Challenge Roth is one of the most spectacular long distance triathlons in the world, mostly due to the large number of spectators lining the course: the latest estimate I heard was of more than 250,000 this year! This was the reason why I chose this race for my first Ironman distance, and I was lucky to get one of the coveted starting places when I signed up about a year ago. 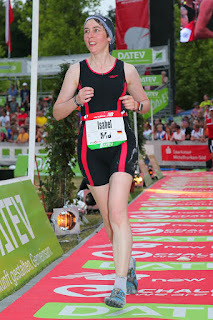 So after one year of training, race day was on July 12th, and I could finally prove that I could swim for 3.8km, cycle for 180km, and run a marathon (42.2km), back to back, and in under 15 hours! 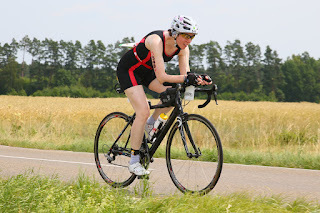 So this is it: my race report. I got up at 3:30am on race day, and only got back to bed at 1am. A long day. But one I'm mightily proud of! After applying the start number tattoo and anti-chafe cream, it was time for breakfast: 2 rolls with strawberry and apricot jam. 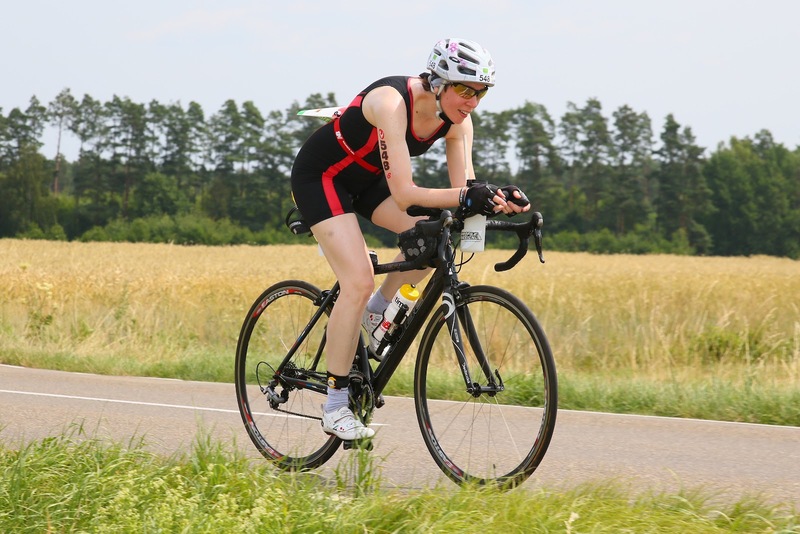 Then a short drive to the swim start, followed by a bit of a wait filled with putting water bottles, gels, and electrolyte tablets in place on the bike; leaving the bag for the first transition in the transition area; waiting; and finally, putting on the wetsuit. Fairly quickly after that the swim start happened, and the race was underway! Orientation in the canal was straightforward, the water nice and warm, and so I could swim at my slow but comfortable pace. 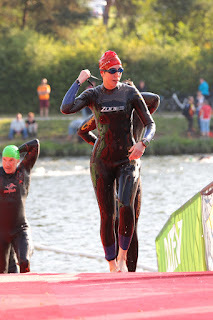 Until the first turning point, when the starters from the following start group caught up with me (they had all announced a sub9 finish, so were expected to be fast), after which swimming became somewhat less comfortable. 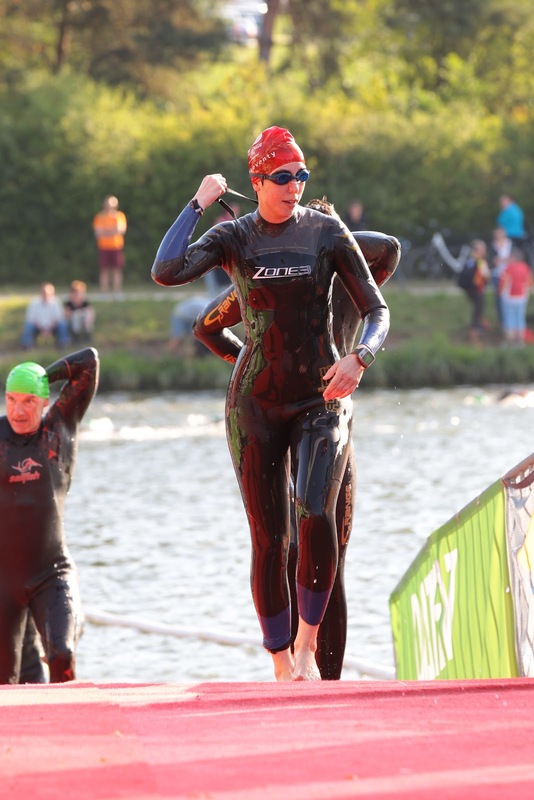 But overall an ok swim, and after 1:31 I was on land again. 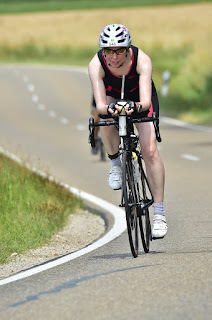 I didn't focus on speed during the cycling - conserving energy and staying within the time limit were my main concerns. The first few km I spent calculating the portion of distance already covered. After 6km: one thirtieth already. After 12km: two thirtieth, that was quick! etc. To my great surprise, I had an average of 28km/h for the first hour, much faster than in training. How did that happen?! Then the tallest hill in the course came close, the 'Kalvarienberg'. I had quite some respect for the hill, so arrived there with some anticipation. The atmosphere cycling up was great: an announcer, a group of cheerleaders, a samba group with drums, and a bunch of other people cheering. Whether it was the atmosphere or the power in my legs, I found the hill to be demanding, but very nice and very doable. The hill flattened out towards the top, and I even managed to pass a few people, very good for (my) morale. Starting from km40 I remember sitting on the saddle became more and more painful. No surprise, and luckily 'only' caused by pressure, not chafing. From around km130 every change in sitting position was really painful. Towards the end of the first loop I approached the famous Solar hill. A great view from the bottom: lots of space to cycle, and crowds lining the hill up to the very top. Very impressive. Unfortunately I don't really like it when there's little space and lots of noise at the same time, which is what happened during the top part of the hill. I cycled as fast as possible just to escape this mess. In the second loop there were markedly fewer spectators (which finally made Solar hill a great experience!). Starting from the top of the Kalvarienberg (~km30 in the second loop) there was a vicious headwind during much of the second loop. Not nice. But I was used to winds from cycling in England, so I suffered less than many of the others. The wind was probably the main reason why the second loop was slower than the first (3:11 vs. 3:25). Overall my average speed was 25.5km/h, much faster than in training. One factor contributing to this probably was the quality of the road surfacing, which was very markedly better than in England. After 7 hours on the bike I arrived at the second transition area, about half an hour faster than the plan! I took my time again during transition. A helper applied a new layer of sunscreen, while I discovered that my right foot was hurting badly. The outside of it was cramping and I had to switch to heel strikes for the first 3-4km of the run. My plan for the run had been to keep a pace of 6:30min/km (a 10:27 mile), and I was able to keep this pace throughout (overall average was a 6:26). Andrey found me at several aid stations and gave me ice water - a very welcome refreshment, and talking to him while he ran next to me was a welcome diversion! I entertained myself by controlling my pace using my GPS watch and passing all the walkers. Many people were walking, starting as early as few km after the start. I definitely had not expected this! I didn't have major problems. Sure, the legs hurt towards the end, but by then the finish line was almost in sight. The worst part were the last 6km, where my lungs were acting up and made breathing difficult. I repeated calming words almost like mantras, and succeeded at least to the point that I could keep the pace, and smile for the finish! In comparison to the other female starters, swimming was my worst discipline (423rd out of 429). Totally fine, because it is the shortest anyway. Next was cycling (371st), and by far my best discipline was running (165th). Keeping running was key to success here. And mental strength helped: I was convinced that I could keep a pace of 6:30, and did not have self doubts whatsoever. Overall, I finished after 13:14:51 hours, 62nd out of 90 in my age group - a great result for my first long distance triathlon! Nutrition was another key to success. Because I didn't like the energy drink the organizers supplied, I made a bike bottle of High5 'syrup', which was enough for 5l of High5 energy drink. So whenever my aero bottle was getting empty, I added syrup, two electrolyte tablets, water from an aid station, and blew bubbles into the bottle to mix the stuff. Worked great, but I only needed about a third of the syrup. In addition, I had two soft flasks with High5 gels, 5 with caffein and 8 normal ones. Every 20 minutes I ate a normal gel, and when I felt tired I ate a caffeinated one instead. I drank some plain water with each gel, which explains why I didn't need as much sports drink as anticipated. When my soft flasks were empty (around km110, as planned) I took gels from the aid stations and ate those. At some point during the first loop I forgot to eat gels, and as a result felt my energy levels drop. I noticed it in time to recover and from then on paid great attention to not missing the 20 minute marks. I also found a very helpful and memorable tip before the race: whenever your mood changes during a race: eat! Especially when the mood changes to the negative. I found this extremely valuable and applied it a few times during the race. Without fail, my mood improved with an additional gel in my belly. There were several people there to cheer me on: Andrey (of course), my family, and some friends from my crazy sports forum. All of them said they saw me several times. Except for Andrey -- who spotted me, and then came to talk to me and run beside me -- I only saw the fast twitchers once, and my family zero times. I was quite focused on doing 'my thing' and hardly noticed specific faces in the spectator crowd. Especially on the run, there was a lot to do (in order of frequency): think hard about what food and drinks to take at the next aid station (gel+water? sports drink? salt? coke? ); control pace; pass other runners; calculate how much distance is left, and how long it will take; etc. Even so, I found the spectators in general very motivating, especially those who cheered me on with my name. Being a girl was a definite advantage here, because the guys around me mostly only got general cheers, not named ones. I started preparing for the race in January and trained for a total of 175 hours and 35 minutes, an average of 6:16 hours per week. About 60% were done on weekends, and 17% (32:15 hours) was high-intensity non-specific training (weight training, plyometric training, core training, sessions similar to Crossfit,... designed by a 'guru' in my crazy sports forum). Putting it in relation with the race distance, it is no surprise that swimming was my worst, and running my best discipline. Considering that there was a lot going on besides training (a new job and moving between cities, among other things), this kind of training meant I could still prepare properly for the race and finish much faster than planned, without being in too much pain during the race. I'm a curious, open-minded girl who is interested in just about everything. I recently decided to quit my old life and get a new one - starting with a year-long trip around the world.